All photos Copyright © Cross Country Nurseries FISH AND KELP FERTILIZER - GALLON - Best for baby plants, and soaking prior to transplanting. This is a liquid fish emulsion product, and is 90% fish and 10% seaweed. 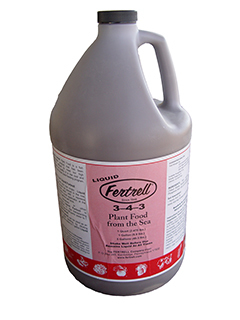 With an analysis of 3-4-3, including ample trace minerals, it can be used as a drench, a soak, or foliar spray. Best for young plants – we prefer Granular Organic fertilizer for production. Use 1- 2 Tablespoons per gallon of water, once a week for the first 3 weeks after transplanting, then monthly if needed. When plants have reached full size, discontinue use of Liquid Fish, but continue with Liquid Kelp. If plants look like they are yellowing and/or need a shot of nitrogen, you may make another application to green them up. We do our first application as a 5 minute soak of the roots/soil/pot just prior to planting, using 2 Tablespoons of each of both Fish, and Kelp#3, followed by a topdressing of Granular Organic fertilizer. Free shipping.